Mike Walker does a nice job compiling the best viral-videos-not-removed-by-the-PGA-Tour-for-copyright-reasons-yet. I must say, while the Players Championship turtle remains my favorite, getting to see a clean version of Sergio's recent club hurl backed by Scott Walker commentary, brought the artistry and technical brilliance of young Mr. Garcia's tantrum to another level. The Presidents Cup, like all events that fall under the PGA Tour umbrella, prides itself on the contribution it makes to charity. Which is great. But oh my, how much more could have been passed to deserving causes had a veritable tribe of golf officials from across the globe – there must have been at least 40 of them – not been expensively kitted out in cashmere suits and jackets for the opening and closing ceremonies at Royal Melbourne last month? The Huggy committee does not normally jump to conclusions, but it is a safe bet that every one of those officials already owns a nice suit, one that would have failed to offend any of the watching public. What a freeloading disgrace. Tiger: "I've heard people question whether Fred would be a good Ryder Cup captain, and I just don't get it." I've heard people question whether Fred would be a good Ryder Cup captain, and I just don't get it. I think that Fred is a great captain. Whether it's The Presidents Cup or the Ryder Cup, it doesn't matter. The way he keeps us loose and how much fun we have -- it's just great to play for him. He's a lot more competitive than people realize. He just doesn't show it. He shows it with us around, but the public doesn't see it. Russell Gould reports that Robert Allenby and Geoff Ogilvy have made up following last month's poutfest in Perth prompted by a pathetic Presidents Cup performance. Is that enough alliteration for one sentence? Jim Tucker's inside sources said "repair work" was done following the Robert Allenby-Geoff Ogilvy kerfuffle threatening to make the Australian Masters wildy entertaining should we get the former teammates paired together. Of course, that would require Allenby to shave about six shots off of his handicap of late to occur, but miracles do happen. I would not have read Greg Norman's Shark Shootout presser if it weren't for Mike O'Malley's tweet, and boy am I glad I suffered through it to learn that the International squad wants their leader back. The Ogilvy-Allenby fracas allowed two talented writers to open the history books and regale us with memories of golf's finest man and woman-spats. Other examples are not hard to find. Not so very long ago, the late Dave Hill and his fellow Champions Tour player, JC Snead, were to be found rolling around on the ground at the end of a practice range in a physical effort to resolve their latest dispute. Former US Ryder Cup player Corey Pavin had an eyeball-to-eyeball confrontation with Golf Channel reporter Jim Gray before last year’s Ryder Cup matches at Celtic Manor in Wales. And it can’t have failed to escape the attention of many golf fans that there is a definite edge to the relationship “enjoyed” by world number two Rory McIlroy and the man right behind him on the rankings, Lee Westwood. Peter Stone downplays the Ogilvy-Allenby imbroglio, shares the not-very-well-known tale of Americans Henry Ransom and Frank Strazza having a row, but also drops this little anecdote about another run-in the same night as the Ogilvy-Allenby war of words. Around midnight at Fraser's, blood was spilled. American Rickie Fowler's caddie, a gridiron enthusiast, became involved in a difference of opinion with a rugby league man over which code handed out the biggest hits. They decided to settle the argument physically. The league chap laid a tackle on the American and then it was the American's turn with what they do in gridiron. The league guy (not known to our reliable witness) decked the caddie as he charged, and the caddie fell to the ground, splitting his head open. Nice to see Golf Channel write some checks to deliver extra programming and even better seeing viewers reward them with decent numbers. I've been a little surprised at some of the reactions I've heard about Royal Melbourne's setup during the Presidents Cup. The complaints and grievances were from people who were speaking up not for the sake of griping, but instead, expressing their disappointment at their sense players could only play defensively due to excessive green speeds and the putting surfaces appearing dead. There is no question that during Friday's hot, dry wind day the golfers were on defensive, but it would not have mattered what the staff and PGA Tour did to the greens, it was just one of those days. But they never lost control of the course. As for the rest of the event, I would say we saw the ultimate in strategic golf and that the reaction people have had has more to do with how rarely we get to see the merging of strategic design, setup, and conditions calling on players to think. - Royal Melbourne's bent, unique to the course and not available anywhere else, is a very dark shade of green, almost black, with some purplish blades. I was shocked by it at first sight and was even more shocked to see an iron application Tuesday of tournament week, but that was designed for a number of reasons, including the desire to not hear people say that the greens were purple. - Television filters skew things. Did you notice the day the teams wore light blue shirts (twice for the Internationals, once for the U.S.)? To some of us the shirts appeared almost purple on television. So just like the yellow waves of Torrey Pines each year, we learn that television cameras and filters alter colors. That may have been the case here too. - The club also uses a dark sand topdressing which may give hints of purple, while the sand the greens grow out of is a very dark color. But I can say having walked on them all four days, the greens appeared very healthy. - Royal Melbourne's greens were never close to dying, nor were they prepared at a speed higher than 13 any day of the event. They were in the low 12s during Saturday's rain event. Fast for those contours, but never unmanageable if you were attacking from the proper angle. And that leaves the "defensive" issue. Longtime readers know there is nothing I hate more than watching golf when players are constantly on the defensive and unable to attack a well-designed course with good thinking and shotmaking. If that was the case at Royal Melbourne, I'd be the first to point it out. Instead, what I saw repeatedly was incorrect placement in the fairways or a refusal to hit run-up shots, leading to approaches not finishing near the hole. If a player and his caddie considered the hole location, figured out the best angle to approach from, the best shot to use and executed, he was rewarded. But on many of Royal Melbourne's best holes, the line between best approach angle and a not-so-good angle is so fine that without announcer explanation of the course nuances (eh hem, Johnny! ), the golf could look defensive or even goofy. This was definitely not the case at Royal Melbourne. And the positive player reactions would validate this. After all, if the set-up was over-the-top, you would have heard them say so. Royal Melbourne was brilliant, I only wish we had more golf like we saw there. Rod Morri pins me down on the central questions of the day: my (mostly positive) take on Australia golf, the Presidents Cup, and the merits of hand cream after a long, arduous 18 holes. We go for fifty minutes, so apologies in advance. If you like podcasts, you can (and should) get Rod's free podcast on itunes. He has always gets great guests and asks sharp questions. An online betting outfit is challenging Robert Allenby and Geoff Ogilvy to hash out their differences in the ring, all in the name of charity. His manager, Tony Bouffler, was confident there would be no lasting ramifications. "All I know is that they have been good mates and I'm sure will continue to be so in the future," he said. Blake also notes the harsh reaction of former touring pro Paul Gow on his podcast with Luke Elvy, where they also talk about Greg Chalmers' dilemma in pursuing the Australian Masters along with other notes from the Australian PGA week. But former US PGA Tour professional Paul Gow said it was time Allenby bit his lip in pressure situations. "I think he acts like a five-year-old when he plays golf," Gow said in his weekly Playing Around podcast with Channel 10 commentator Luke Elvy. "He has to understand he plays golf for a living. He was in a team environment and to throw out those comments was really immature. "It's probably time for Robert to grow up, let his clubs do the talking because he's a really, really good player. With this attitude, he will probably never win a major." Brent Read reports on Robert Allenby's continued meltdown over his horrible Presidents Cup play, with Geoff Ogilvy's Sunday tweet perhaps fueling an "ugly spat" Sunday night following Australian PGA play. Allenby and Ogilvy exchanged words at the Hyatt Coolum on Queensland's Sunshine Coast where the pair were playing in the Australian PGA with the former believed to have challenged his long-time friend to take the matter outside. The incident took place in the village square at the Hyatt, where players, caddies, family members and the public were celebrating Greg Chalmers's victory earlier that day. At least one glass was broken before Allenby, who lost the play-off at the PGA that day to Chalmers, walked away, prompting Bronx cheers from a section of those in attendance. Ah that must have really soothed his ego. Ogilvy responded with a tweet that read: "Warms the heart to see Robert playing so well this week." Ogilvy later told media the tweet was genuine, although Allenby is believed to have taken offence at what he felt was a piece of sarcasm. It is understood he questioned Ogilvy over the tweet and his Victorian counterpart responded by asking why Allenby refused to take responsibility for his play. The conversation degenerated to the point where a glass was broken and an offer was made to take the matter outside. Allenby left the country but will be back for the Australian Masters at Victoria in a few weeks. Victoria, a splendid design, is Ogilvy's boyhood home course. And when Allenby sauntered over to Ogilvy's table and sat down at around 9.15pm on Sunday night, the 2006 US Open champion immediately made his dissatisfaction known. He was overheard accusing Allenby of throwing him under the bus and openly questioned his character, which sent the four-time PGA winner into a rage. Allenby inadvertently broke a wine glass and screamed 'do you want to go?' (fight), prompting Ogilvy, who was surrounded by seven friends, to get out of his chair in front of a captivated and stunned audience. Common sense prevailed as Allenby softened his approach momentarily. But the argument soon flared up again as Ogilvy unsuccessfully sought an apology. The ugly stoush escalated once again as Allenby invited his adversary to meet him outside of the main square, to which Ogilvy quipped 'I'd like that'. Allenby subsequently stormed out as Ogilvy sat calmly. "In short, we still don't know if Tiger will really be back. But Australia gave us some strong evidence that he is finally feeling accepted." I rarely disagree with my colleague Jaime Diaz, but in the case of his Golf World column on what Royal Melbourne proved about Woods game, I don't agree. The Royal Melbourne Composite course may have been a beast, but it played to Woods' strength. For all the hosannas raised to the Alister Mackenzie masterpiece, at less than 7,000 yards, to hold up, it had to be tricked up. Only carefully crafted and supremely struck iron shots were well received by the rock-hard and crazy-fast greens, and Woods can still hit more of those than anyone. What the layout didn't require was the driver, and that's the club that will tell where Woods really is with his swing. Finally, Woods got a relatively easy singles draw against Aaron Baddeley, who was shaky after his Calcavecchian miss off the 18th tee on the opening day set a negative tone for his team. In short, we still don't know if Tiger will really be back. But Australia gave us some strong evidence that he is finally feeling accepted. Other than some silly rough, I don't think Royal Melbourne was tricked up. As I noted in my story for the same issue of Golf World (not posted), the PGA Tour staff did a super job backing off the pedal to ensure that the course was not tricked up during Friday's potentially Shinnecockian day. Furthermore, the conditions were major-championship-like in terms of crowd presence and speed of the golf course, making the kind of golf Woods and several others displayed pretty telling about the level of one's game. Now, as for the driver issue, it is true that Woods didn't have to hit a lot of drivers. But a quick look at the 2012 major schedule will show that the driver will not be an important club at two and perhaps three of the venues. 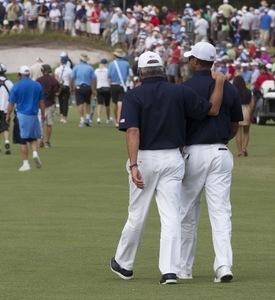 Stingers will be a golfer's friend in 2012, which bodes well for Tiger. 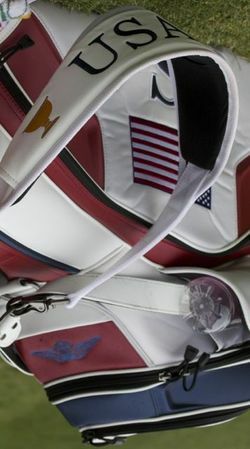 I was a little disappointed that Marty Hackel opted not to highlight the International team decision to have player wives wear their last names on the back of certain clothing items or to display caddie names on bags, but even more alarming is the U.S. team photo that includes embedded journalist Bob Verdi! As I continue on in the land where Internet access went to die, a few final reflections from Tasmania on the Presidents Cup week at glorious Royal Melbourne. The week wasn't without a few minor hiccups worth noting for the next time championship golf returns there. The dreadful landscaping effort down the 15th fairway (17 East). New mounds and out-of-place landscaping need to be replaced by the new consulting architect who presumably replaces the person that came up with this. Using the first and second holes of the West Course as the Presidents Cup finishing holes. Even though they were not reached a lot, I still wonder if they should have been the openers and the 18th on the East the finisher (instead of playing as the 16th on the Composite). The course might have had a slightly kinder opening flow, and a stronger finish. That the bunkers being so groomed during the Presidents Cup. Instead, go for the look seen at the rest of the sandbelt and rake 'em just a couple of times a week, leaving the floors nice and firm. That we won't be returning to this magnificent, endlessly fascinating and ideal venue for championship golf anytime soon, or for a major championship. But the women will be there in February and we'll get another fix of this amazing place. With the holiday week and my need to inspect Tasmania's finest golf, not to mention a 15 hour plane ride home, posting will be light. Still, I just can't let go of Royal Melbourne yet, so there's my Golf World Monday item with a few player quotes and here, in a stunning world exclusive, a few more thoughts on the course. Frankly, it's morbidly depressing to think we won't see a tournament golf course this fascinating for a while. I could have filed a book on what I saw out at Royal Melbourne this week, but I'll only bore you with a few observations. The course gets more interesting, more fascinating and more beguiling each day you study it. I watched five days of golf there and feel like I hardly know it. The conditioning. So firm, so fast and so pure, yet not too green or unnatural in appearance. The bunker faces are firm with little-to-no sand on them while the floors are raked. There is simply no excuse for not doing this in the United States and elsewhere. The club has the best members-only logo in golf. I'd post it, but what's the point. We aren't members. Not all of the best holes on the property are on the Composite course, meaning the tired suggestion that it's not great because it requires a Composite 18 is, well, tired. The par-3s. Tiger said it after the round, and it was echoed by several players: par-3s do not need to be 250 yards to be interesting. They can be 150 yards and still all the best players can handle...assuming the architect did his job. And to think they left out several others on the property that would have been just as fascinating to watch. Every Presidents Cup match played the most interesting holes on the course. Yes, many of RM's standout holes came early in the round, but every match passed through the first through sixth holes, and for that matter, the seventh through thirteenth. It was considered an unusual flow, but it worked well. They open their doors to professional golf. The Presidents Cup this week, the LPGA in February. The Composite course features three of the best short par-4s in the world. As in, top 10 on my or most sane individuals' list of favorite short par-4s: 1, 6, 10 on this year's Composite, better known as 3 West, 10 West and 1 East. "MOST WATCHED DAY TWO IN PRESIDENTS CUP HISTORY"
ORLANDO, Fla. (Nov. 20, 2011)– Golf Channel’s coverage of The Presidents Cup broke another record, with Day Two viewership topping Day One – the previous best day – to become the most-watched day on cable in the history of the biennial tournament, according to preliminary national ratings released today by Nielsen. This milestone is especially significant given the 16-hour time difference between the U.S. Eastern time zone and Australia. Golf Channel's Day One and Day Two coverage from Melbourne both surpass all previous days on cable TV in the history of the event, which includes four days on ESPN, eight days on TNT and two days on Golf Channel. Data showed average viewers for Day Two coverage was 1,508,000. Average viewers for Day One and Day Two combined was up 123 percent from comparable days when the event was last played overseas (South Africa, 2003). Viewership for Day Three and the Final Day of The Presidents Cup will be available when national ratings are released by Nielsen. The Presidents Cup Day Two coverage anchored Golf Channel’s Thursday primetime schedule, which replaced Wednesday as the most-watched and highest-rated night in primetime ever on the network. I have writing duties, but I think I can sum this place up pretty succinctly: the course got better, more interesting, more intricate and more fascinating to watch every day. 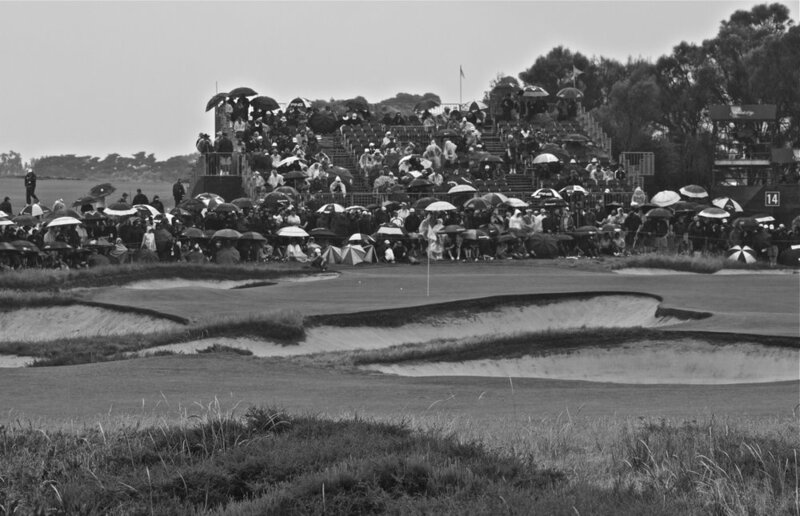 Only the Old Course might be more interesting, but certainly not as fun for spectating because of sightlines. Anyway, I was parked on the first hole Sunday, so that's where my images are fun. Your thoughts...assuming you aren't waiting to watch the tape delay coverage on NBC. The International team has no margin for error Sunday and while the Captains didn't exactly think theatrically with their matchups, the course, improved weather and some juicy hole locations should provide fascinating golf.